VAMFF Melbourne and International Women’s Day, ethics and sustainability shine through fashion month with Stella McCartney and Balenciaga, nominees are announced for the BT Emerging Designer Award. Read on for a KitX Warehouse Sale. The Virgin Australia Fashion Festival, held in Melbourne, means we won’t be twiddling our thumbs between the end of fashion month and Mercedes-Benz fashion week. Running from March 1st until March 18th – the festival is Australia’s largest fashion event and features forums, runways, showcases and seminars. Designers on runways include Alice McCall, Sass & Bide, Bec + Bridge, Nice Martin and more. To top it off, an International Women’s Day Forum was hosted by Nicky Briger, Editor of Marie-Claire, on Thursday 8th with the speakers including Natasha Stott Despoja, Cardiothoracic surgeon Dr. Nikki Stamp, and best-selling author Liane Moriarty (Big Little Lies). The Australian Fashion Council and BT Financial Group have collaborated once again this year to bring the 2018 BT Emerging Designer Award to one lucky winner. The award – designed to provide start-up designers with the necessary means and platform to thrive within the fashion industry – will be presented on March 28 to one fortunate Australian designer. This year’s nominees and finalists include Double Rainbouu, Anna Quan and Albus Lumen. Their prize has a total value of $70,000 – including $10,000 in cash, a British Airways business class flight to London, a lookbook produced and styled by Vogue Australia as well as business and financial services provided by BT Financial Group and Bentleys NSW. Previous winners include Christopher Esber, Kacey Devlin and Emma Mulholland. In an environmental and political statement that stood out amongst her fashion week comrades - Stella McCartney presented her guests with 100% compostable invitations. The invitations came in a glossy pouch and had the following message printed on them: “I am 100% compostable (and so are you!)”. Inside the invitation were a pair of 85% upcycled yellow, yarn socks – made using no water, chemicals, dyes or pesticides. Demna Gyasalia is best known for his Triple S sneakers and oversized anoraks, but this season, he’s hoping to be known for another genius fashion decision. 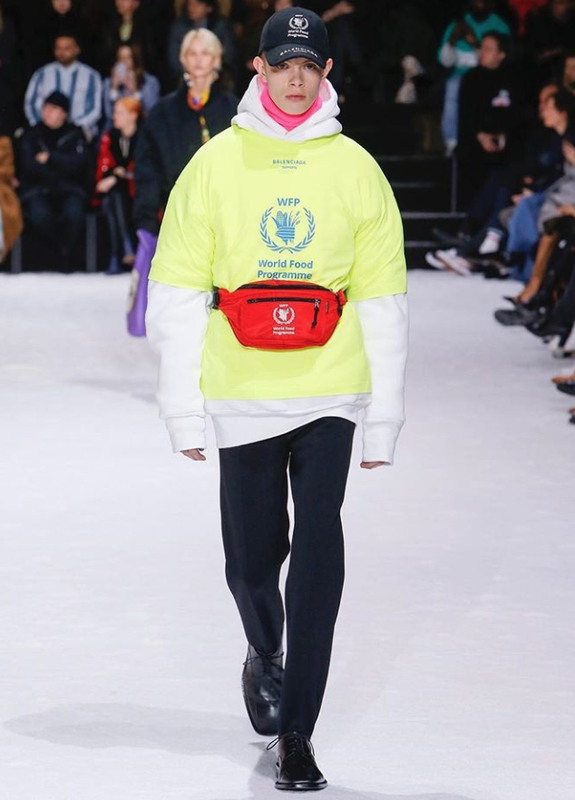 This year’s Balenciaga collection is in collaboration with the UN’s World Food Programme – the brand has released series of designs under the brand’s usual aesthetic. Logo baseball caps, bumbags and t-shirts are just some of the items on sale under the collaboration. Balenciaga has donated $250 000 and will give 10% of the retail price to the UN for each item sold. Gyasalia said: “For the first time I thought that fashion could be useful in a different way than just covering the body”. In another idea that has taken the fashion world by surprise is the creation of a Balenciaga hotline, printed on shirts included in the collection. The hotline is, “...a never-ending hotline, for people who have a lot of time”, according to Gyasalia.